Seven Arrows is one of only two schools that we researched in Los Angeles with the capability to differentiate math instruction to accommodate advanced learners. The implementation of Singapore Math has proved a remarkable success, as shown by an all-around increase in our students’ abilities and mathematical knowledge. The Singapore Math curriculum meets the needs of many types of learners by meshing the best of traditional and progressive approaches in pedagogy. Its authentic emphasis on a type of learning honors process, critical thinking, and genuine understanding rather than rote learning, teaching to a test, or superficial instruction in concepts that must be revisited months and years down the line. Long Division with 2nd Grader, M. Antoni from Admissions SAE on Vimeo. Not only are the rigor, depth, and retention of Singapore Math far sounder, but our students report enjoying it much more—especially older students who have experienced other programs and can speak to the benefits of the Singapore approach—once again demonstrating that a true love of learning is students’ best tool for excelling academically. Students are asked to make meaning of Singapore Math: The focus is as much on examining why various approaches work as on getting the correct answer or even just figuring out how to solve a problem. Mastery is the goal, and the best way to master skills is to sit with them longer and concentrate on fewer concepts more deeply. 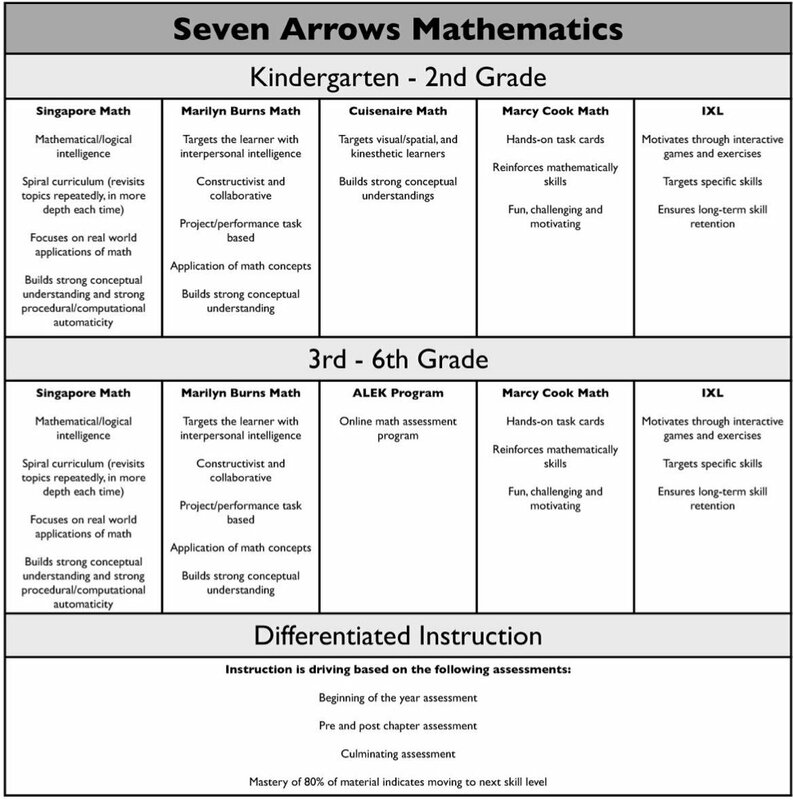 We’ve seen at Seven Arrows— and the verdict is true nationally as well—that children in the Singapore Math program can gain a year or more on children in other programs, owing to this learning-for-mastery approach. Singapore Math follows the same three steps in virtually every lesson: It moves from the concrete to the pictorial to the abstract. The first step often includes hands-on aids such as blocks, cards, and chips, which allow children to physically engage with the concept. Next they are asked to represent the concept in a picture, such as a bar graph. Finally, they are introduced to problem solving approaches and algorithms. Traditional math instruction at its best jumps from the concrete to the abstract, and at its worst, straight to the abstract. However, when children engage with the material in multiple ways—tactile and visual as well as traditional—they are far better able to master it. Furthermore, the pictorial step is truly essential, not only because it provides reinforcement for visual learners, but also because it asks children to show what they are learning on paper rather than taking a newly learned concept straight to the abstract. Their understanding is solidified when they actually create and see what they’re about to do. Not surprisingly, Singapore Math instruction is most often criticized for the expense. Implementing the program effectively requires a great deal of time and money, many hours of teacher training, and community buy-in. Singapore Math is not necessarily intuitive for those of us who learned math very differently, and it requires detailed and purposeful instruction by knowledgeable teachers. At Seven Arrows, all homeroom teachers receive continued instruction and support from outside experts, collaboration with peers and our curriculum director, and feedback from classroom observation. The final step is to get buy-in from parents to ensure that we are all working toward a common goal. In addition to the Singapore Math program, students from grades 3-6 work independently on the Assessment and Learning in Educational Knowledge Spaces (ALEKS) program, a web-based tool for assessment and fluency. ALEKS is a way for children to challenge themselves and further their knowledge of new concepts and skills. Grades 1-6 also use the IXL web-based program for targeting areas of mastery and specific skills. IXL motivates users through interactive games and exercises while keeping teachers and parents informed and involved. The goal of IXL is to help students acquire an in-depth understanding of concepts, thus ensuring long-term skill retention.